Planning a fun night out with the girls? 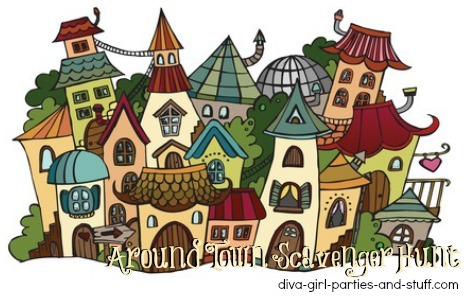 Why not try an around town scavenger hunt. All you need is a couple of lists, transportation, and possibly one camera per team. The list below includes things to find and photos to take. Use either one or both. Choose the items that best suit your town and/or add a few items of your own to make it a custom around town hunt. Every town is different, so this list can be written a hundred different ways! Have fun exploring your town and meeting new people. Maybe you'll even make a new friend or two. ___ A receipt for 50 cents worth of gas. ___ A disposable coffee cup with a business logo signed by an employee. ___ A free promotional pen (must have company's info on it). ___ A one cent stamp. ___ A newspaper clipping of a women's event. ___ A 1980 coin (any denomination). ___ A family recipe from a local resident. ___ A photo of an out-of-state license plate. ___ A travel insurance form. ___ A bank deposit envelope. ___ The phone number of the phone booth at _____________ (address). ___ The best price for steak dinner in town. ___ How many swings are at _________________ Park? ___ How big is the ice surface at the local rink? ___ What restaraunt is open latest on Saturday nights? ___ How much is a pina colada at the local bar? ___ The business card of a cosmetics salesperson. ___ The business card of a gynecologist. ___ Someone walking their dog. ___ A team member pumping a stranger's gas. ___ A stranger serenading your team with an instrument. ___ Someone with more than four children (including children). ___ The smallest house you can find. ___ Graffiti in a local business' washroom. ___ Someone 85 years old or older (holding their id). ___ Team sharing one soda (every needs their own straw). ___ A local town official. ___ The longest limo (or car) you can find. ___ Team receiving dessert complete with lighted birthday candle. 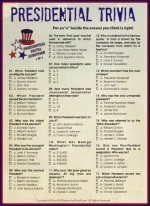 If you are conducting your Around Town Scavenger Hunt in a big enough town or city, let teams know that they are required to use public transportation only (no use of personal vehicles). This will provide an added challenge and a completely different view of the city. For more Around Town Scavenger Hunt ideas try our Fall Neighbourhood Scavenger Hunt, Neighbourhood House Hunt or Mall Scavenger Hunts.